Steve Doughty at the British newspaper the Daily Mail offers a piece on a British judge ruling that the possible "seventh man" in the 1950s Cambridge spy ring named in a letter cannot be revealed. 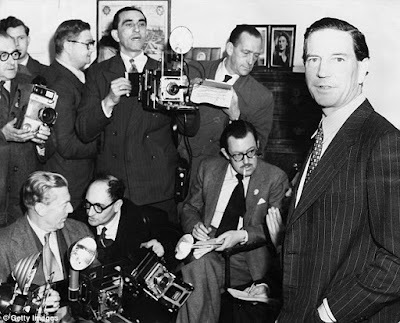 (In the above photo, the "third man," the late Kim Philby, meets with reporters). A man connected to Britain’s most notorious spy scandal cannot be named, a judge has ruled. His identity must remain secret even though historians say he could be the ‘seventh man’ in the 1950s Cambridge spy network that included traitor Kim Philby. Judge Peter Lane ruled that the suspect’s name cannot be revealed as he is still alive and it was ‘quite possible that personal relationships could be jeopardised’, and there was no pressing need to identify Cold War defectors. The man is named in a letter held in the National Archives in Kew, South West London. Its existence was traced by historian Andrew Lownie but he was denied the right to see the letter following a Freedom of Information request. That decision was upheld in the publication yesterday of Judge Lane’s first-tier tribunal ruling. Historians criticised the ruling, saying possible social embarrassment was no reason for shielding a traitor from exposure.